This batch will make approximately 10-12 shortcakes depending on scoop sizes. 1. Weigh out the Softened Butter and place it into a mixing bowl. 2. Measure out the Vanilla Extract with a measuring spoon or teaspoon and place in the bowl. 3. Whisk the Vanilla & Butter together using your hand whisk (on a medium speed) until it’s very soft. 4. Weigh out the Cornflour/Cornstarch and Self Raising Flour and then sift into your mixing bowl. 5. Use a spatula to combine the ingredients together. 6. When it starts to bind, use your electric whisk to blend the mixture into a smooth paste. 7. If it is soft enough, you can pipe into the cases using a star nozzle or for the easy solution grab an ice cream scoop. 8. Add one level scoop of filling to each cake case. 9. Once they are all filled with what looks like ice cream scoops, make an indent in the centre of each filling with the end of a wooden spoon to create a dip in the centre. (This makes a dip while baking which is needed for the jam later). 10. Place the tins in the oven for approximately 18-20 minutes or until golden brown. 11. Once baked remove from the oven and place the shortcakes still in the tins onto a wire rack. Leave them there for approximately 15 minutes. 12. After the 15 minutes have elapsed remove the shortcakes out of the tins and leave them to cool fully on a wire rack. 13. 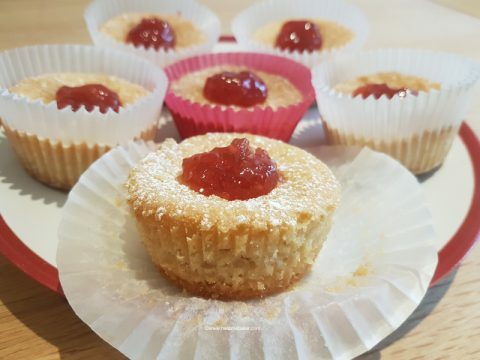 Lightly dust with icing/confectioners sugar and then place a spoonful of jam in the centre of each cake. 14. Eat on the day they’re baked. 15. Enjoy with a pot of tea.